I am not a very scientific allotmenter. 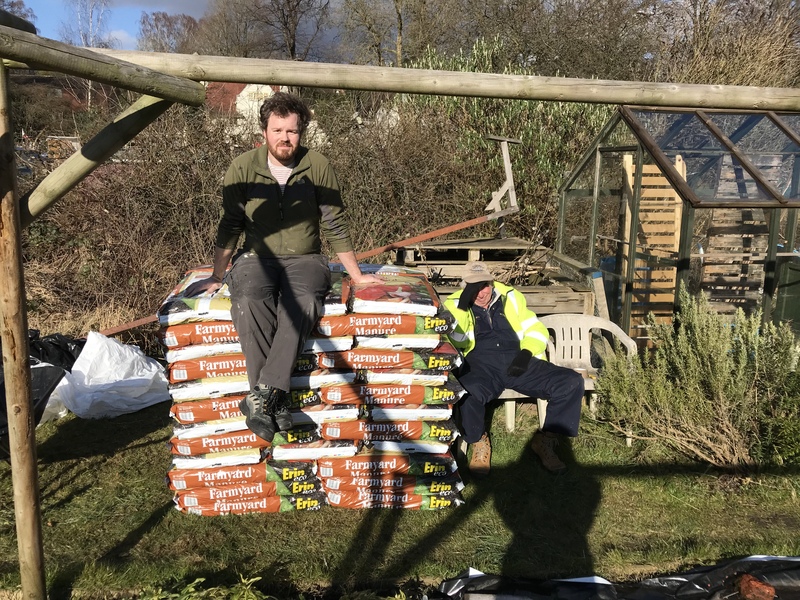 Old-school gardening books talk about soil structure, phosphorous, lime, pH levels and so on, and I’ve never got to grips with any of it (though never say never). But I do know that – just as you can’t expect a human to perform well on a diet of Big Macs and Coke – our soil needs a little help every now and then. Poor soil = poor veg. 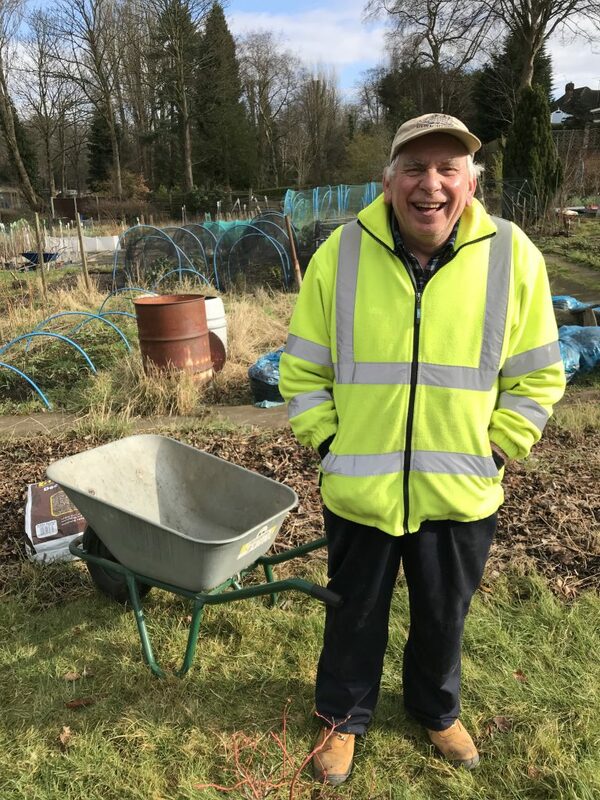 And so this weekend my Dad brought a lorryload of manure to Birmingham and we spend a few hours carting (or wheelbarrowing) bags and bags of the stuff from the lorry to the allotment. It’s not been spread yet – a job for another day. And actually, given that most of my days are spent on the floor/sofa/bed singing If You’re Happy and You Know It, it was good to be outside, stretching my limbs. I just need the weather to warm up. Spring, come soon! There are many life changes that come with having a small baby in the house. Some big (disturbed sleep, general worry) and some small but unforeseen. 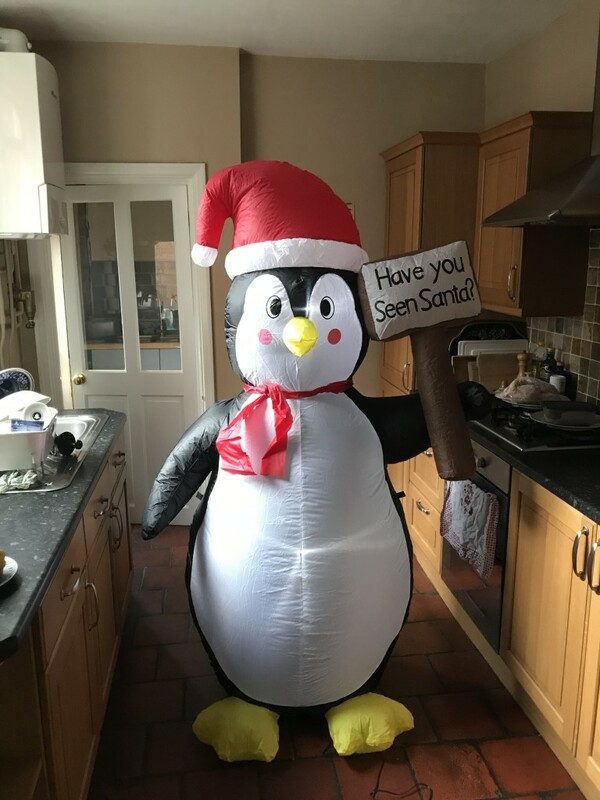 I had not realised, back in those summer days of waddling around as if nothing was about to happen, that my cooking would be seriously disrupted by Harry’s arrival. To begin with, he wouldn’t let me put him down for more than a few minutes at a time. I quickly discovered that it’s impossible to chop, stir, fry, roast or boil with a wriggling baby in your arms. For this reason, between September to about early December I think I lived on tea, toast and hummus. He’s now happy to hang out in his chair or play mat for some time, but each day is different: On Monday he’ll babble to himself for an hour….then on Tuesday he’s having none of it and wants entertaining NOW Mummy! So I’ve learnt to cook in short, sharp intervals. Anything that involves short periods of intervention or preparation work well – from the freezer pies that I can heat up after bedtime, to the quickly rustled-together poached egg on toast (there is still a general toast theme). In recent weeks I’ve discovered that it’s possible to do bigger kitchen projects, provided that they need plenty of hands-off time. 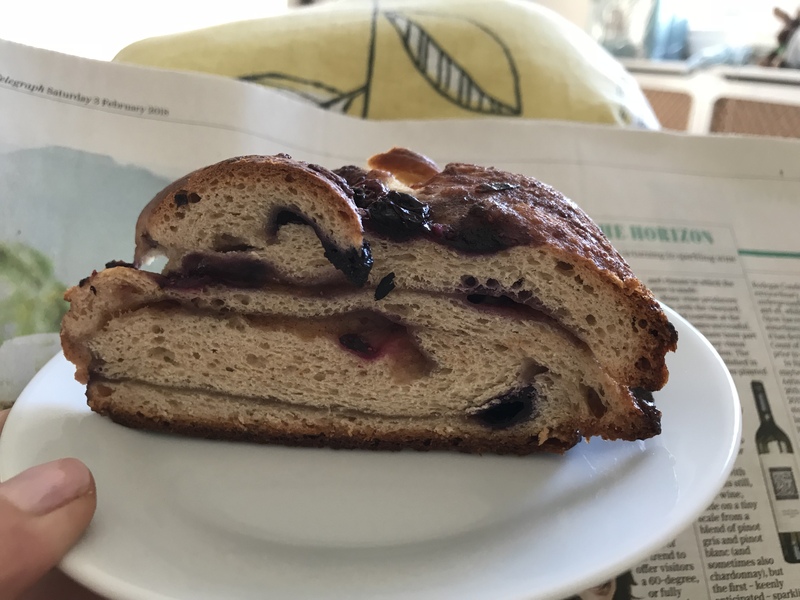 Last month’s marmalade is a good example, and this weekend I had a go at a blueberry couronne – a sweetened dough stuffed with cinnamon butter and blueberries, twisted and baked to gooey goodness. In total it took about 5 hours to make, but each intervention (making the dough, kneading, twisting) was less than 10 minutes. Perfect baby-friendly food. I used my recipe for apple buns, substituting the apples for blueberries and mixed spice for cinnamon. 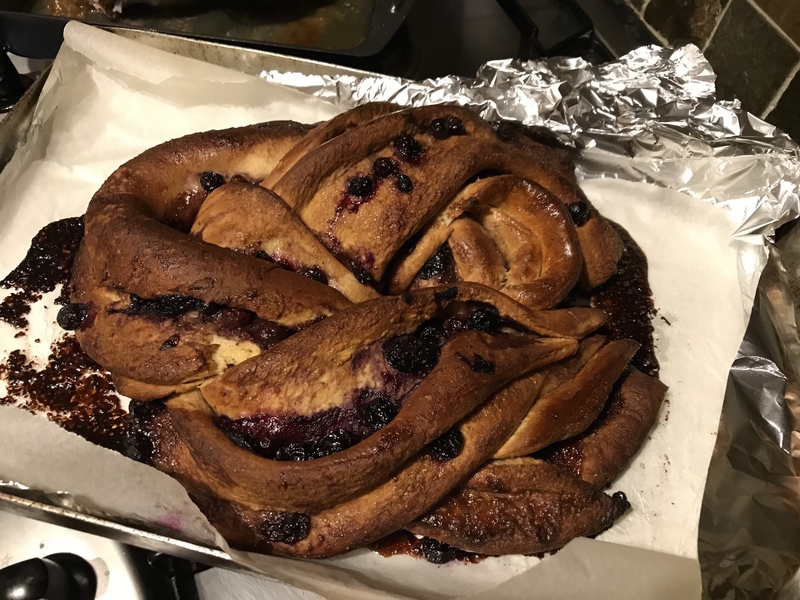 But instead of making buns, I baked the dough as per the recipe for chocolate couronne. Perfect for weekend brunching with the newspapers. 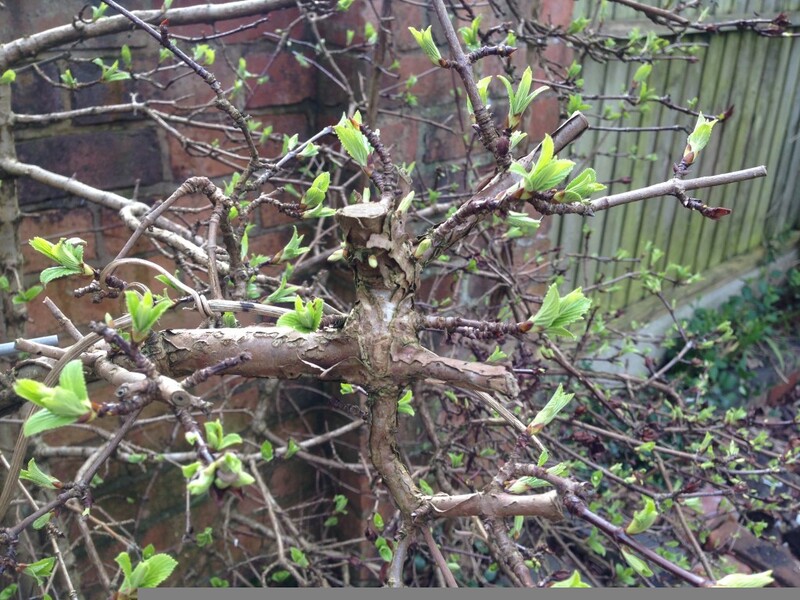 I don’t know if I can take the same approach with allotmenting…the challenges of gardening-with-baby remain unknown! 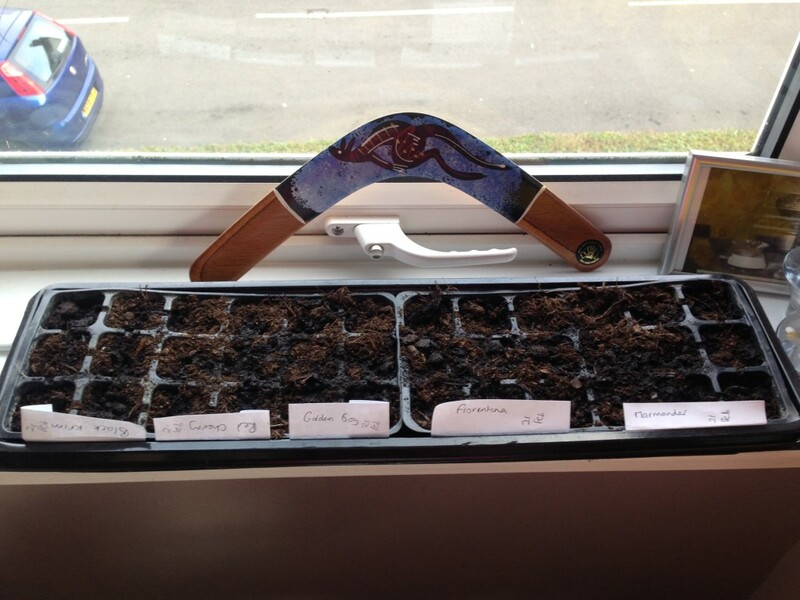 But I did find an hour yesterday to sow the first seeds of the year, whilst the boys watched the Six Nations on the telly. 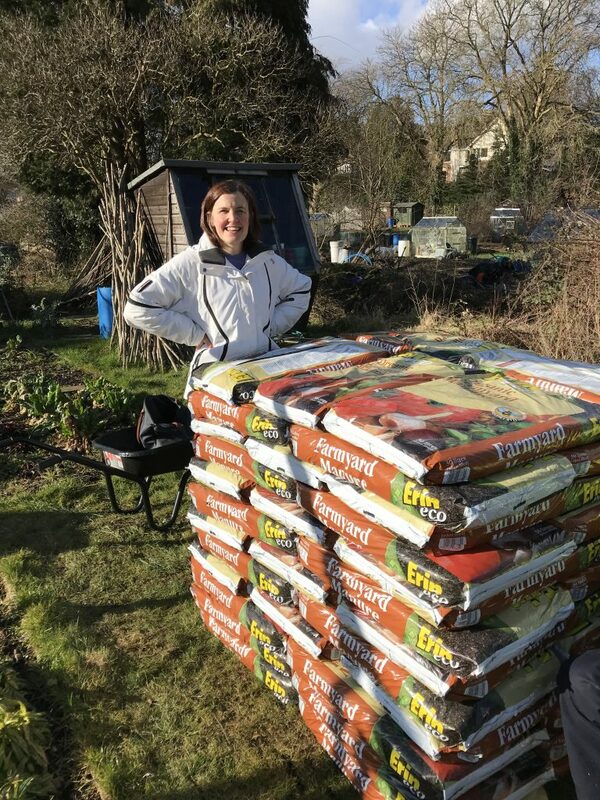 Broadbeans, sweet peas and cleomes are now buried in their compost cocoons, ready for the strengthening spring sun to encourage them to life. I now have the taste for planting but I must remember my plan to not do too much this year…no stress…no unnecessary hassle. It’s difficult not to get carried away with seeds; why plant 4 if you can plant 12? And before I know it, the allotment will be a jungle again! Hibernation has set in, as it does every year. When I realised that I’d have a small baby during the winter I was certain I’d get down in the dumps, but it turns out that the gentle rhythm to our day sits beautifully with the darker months. The Harry-shaped alarm clock means we’re awake before dawn, and every morning I thank my lucky stars that I don’t have to venture out into the dark and cold to head to an office (hurray for self-employment). Harry gets his first breakfast, then hot tea with cranberry and orange breakfast bread, emails and the Today programme are the order of the day before baby gets washed and dressed and devours his second breakfast. A million jobs are done between nap times and other feeds, then by 5pm the fire is on and it’s time for our nappy-free-disco (half-)hour. So by Harry’s 6.30pm bedtime it’s dark anyway and there’s no yearning to be out in the evening. Despite not feeling Christmassy in any way, shape or form (this despite the decorations having been up for a week), I am all over seasonal change. Yesterday I bought thirty quid’s worth of candles to see me through until April, and today we donned our waterproof outfits to trudge out in the snow. 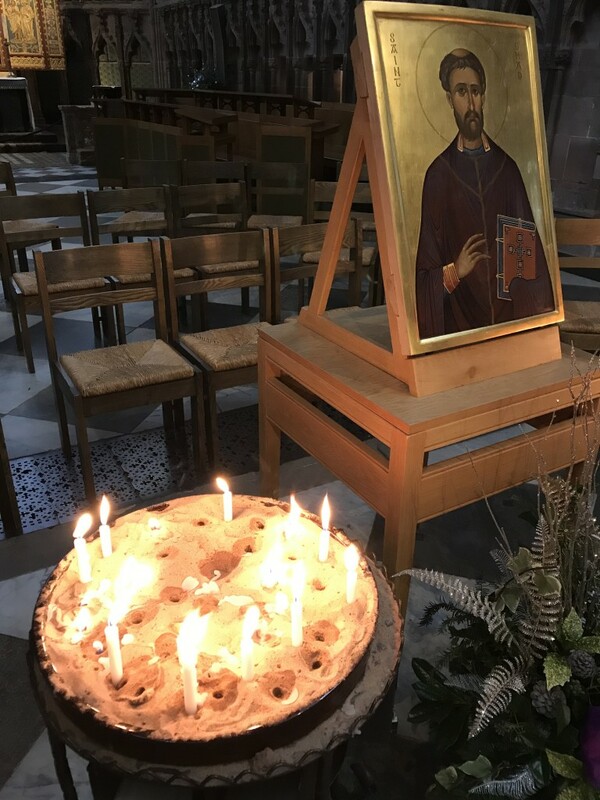 We’ve been to Lichfield Cathedral and breathed in the flickering candlelight, and in the kitchen, soups, curries and anything-with-gravy are the order of the day. On the allotment, I find that the black plastic sheets I put down a fortnight ago have escaped and that our kind allotment-neighbour Martin has tried to secure them into position with stones. Affirmative action is needed. Fingers numb with cold, I pull the sheets back into place and drag planks of wood on top in a last-grasp effort to keep them in place. There’s no-one around and the only sounds on the snow-covered plots are birds going about their business. I have a fairly bad case of baby-brain at present and so I’ve been looking at my pictures from the year to try to remind myself what I actually got up to in 2017. 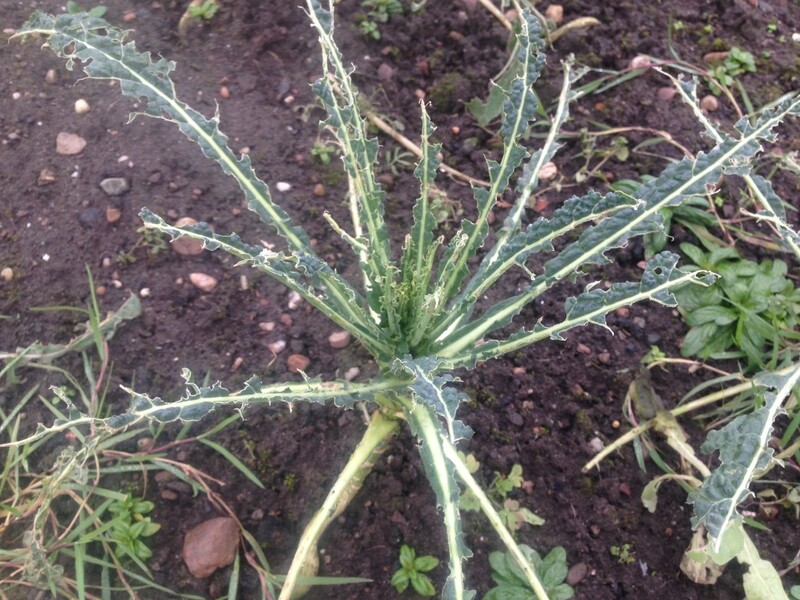 I notice that the kale and cavolo nero plants have been cropping since July, and now in December they’re still going strong – if anything they’re better than ever, relishing the cold that has zapped the whitefly. Today’s picking will probably be stir-fried with ginger and garlic to accompany a warming rabbit dhansak (Matt’s creation). I still can’t quite bring myself to be out on the allotment, though it’s not for lack of jobs that need doing. I’m painfully aware that the autumn-cropping raspberries need a good chopping back (not a difficult job, but a lengthy one) and I should be thinking about getting some goodness into the soil (read: spread some manure). But the key word here is thinking…there’s alot of thinking and not much doing. 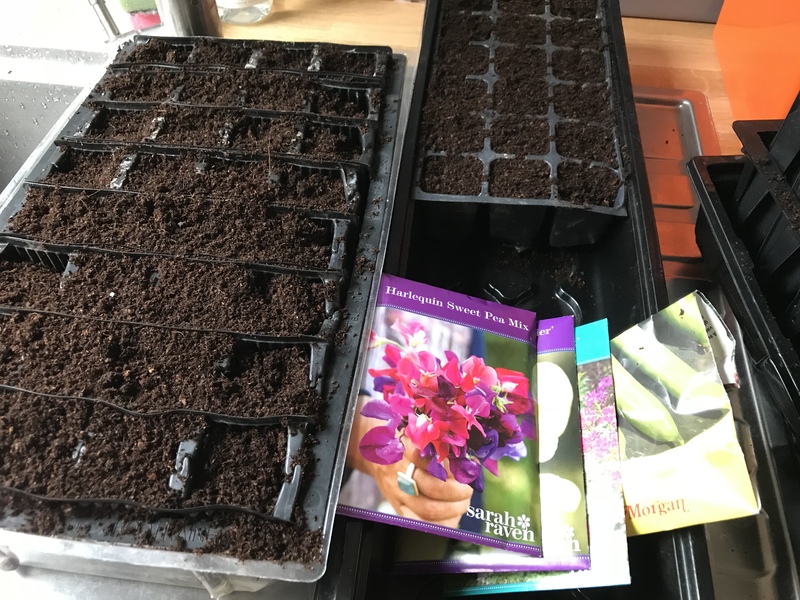 So whilst the great outdoors is still chilly – there was hail today – I’m contenting myself to sorting out my seeds for spring planting, and wondering where all these tiny seedlings are going to live for the next few months. Because, dear reader, this year I have the grand total of 50 varieties of vegetables, salads, herbs and flowers that will soon need starting off! There is reason behind this seed madness. My doctor has been telling me to take vitamins but surely to God that is why spinach was invented? And tomatoes, and sweetcorn, and kale, and chillies, and squash, and beans, and you get the picture. So rather than sink my hard-earned cash into the big pharma companies, I’m investing in my diet instead, and that’s where Seeds of Italy and Sarah Raven come in. 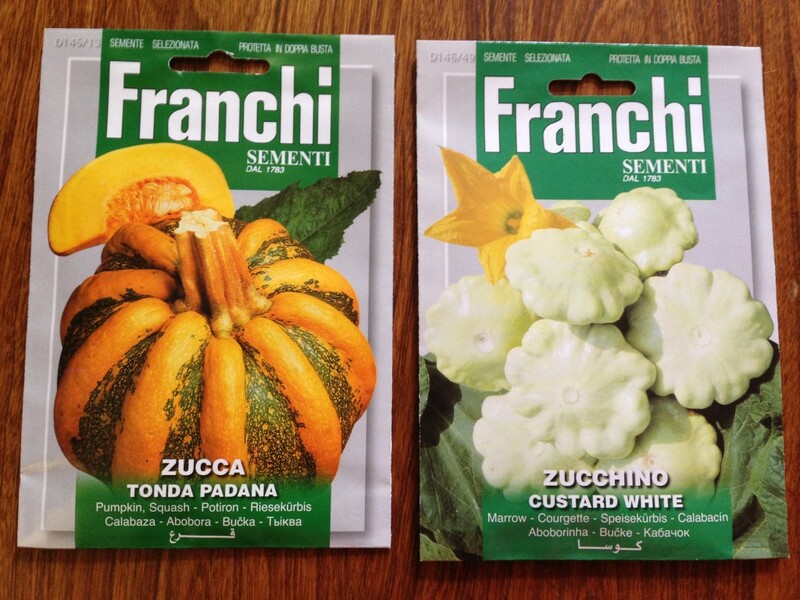 New discoveries for 2017 come courtesy of Seeds of Italy, who are offering this particularly fancy-looking pumpkin and my favourite UFO-shaped squash custard white. I’m also having a go at runner beans this year for the first time (notwithstanding the ongoing slug-wars) and a late-to-bolt spinach, Tuscane. 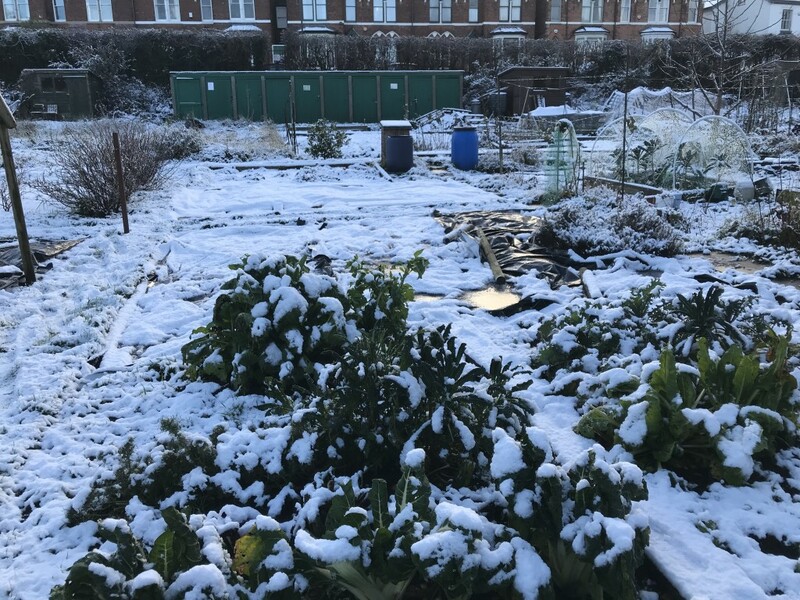 Plus there will be the usual mix of kale, courgette, carrots, parsnips, tomatoes and chillies, though no beets this year – grown on our soil they only seem to taste of, well, soil. Ugh. 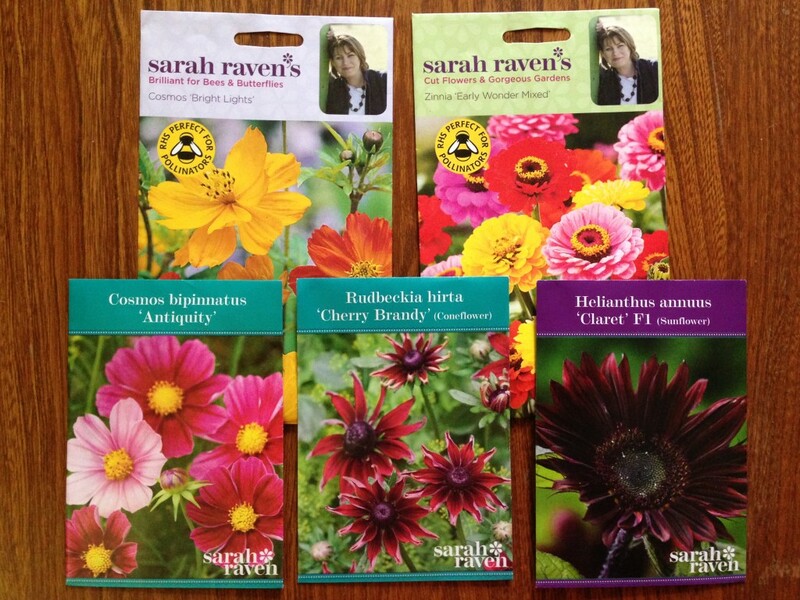 On the flower front, I’m bolstering my favourite white cosmos purity with a host of brightly-coloured newbies. There’s a carnival of colour with this zinnia mix, and I’m hoping that the cosmos bright lights mix will go well in a mixed bouquet with the sunflowers claret and valentine. I’ve also plumped for the delicate antique pink of cosmos antiquity and I’ll have another go at rudbeckia (last year the slugs ate the lot). 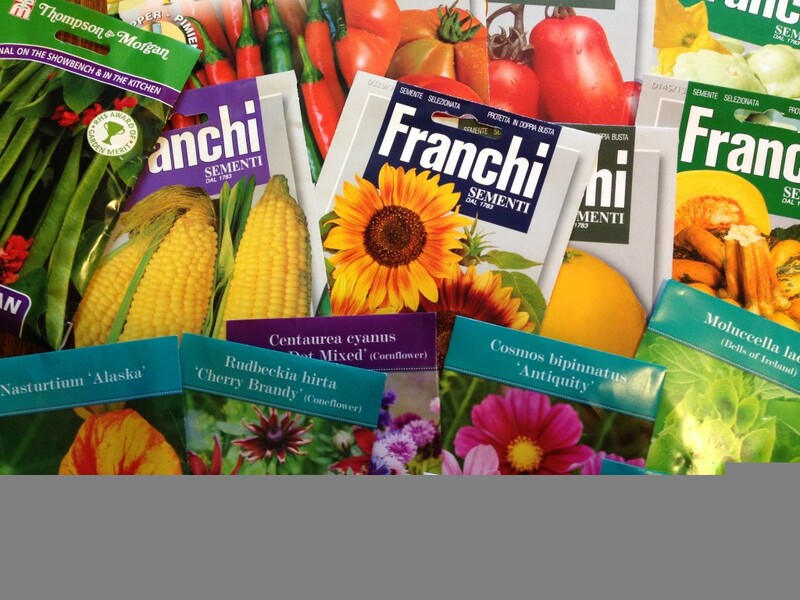 …and loads of bright annuals! The issue now is where to put them all. 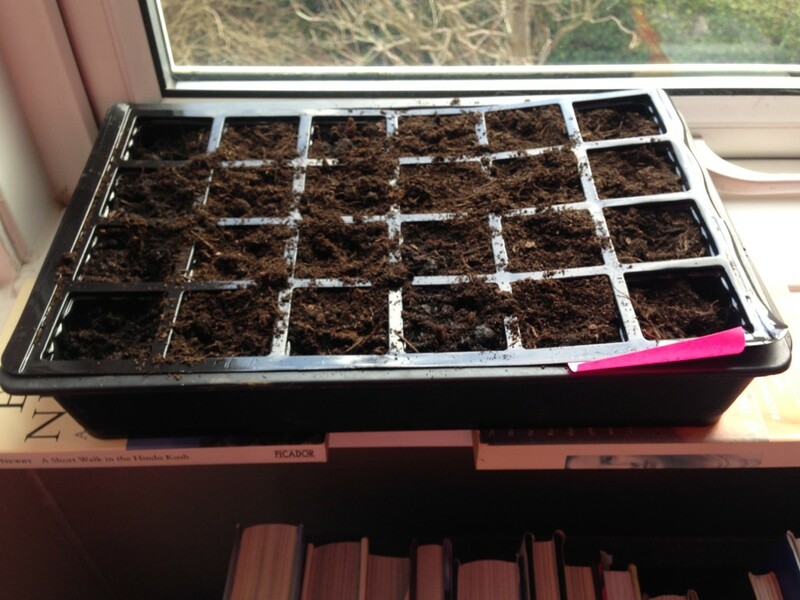 When we lived in the flat, I used to balance seed-trays on our windowsills with the help of a few trusty paperbacks. This house, though bigger, has very few suitable windows and those we do have are prime hanging-out territory for the cat (I’ve learned that Gertrude and seed trays do not go together). SO I’ll have to make an interim potting shed in the ‘sun room’ and balance the trays on a few trestle tables pinched from Matt’s business. It’s a plan. Only thing now is to actually get the pots and compost together and get planting! BIG UP: A final note to big up my Mum and Dad who braved the inclement weather on Saturday to plant a climbing rose in my back garden. This lovely plant was a gift from Matt’s Mum when we moved house last summer, but it’s taken several months for me to clear out three massive hydrangeas and prepare the parched soil so that it has a cosy place to live. I am, however, hopeless with a drill so my Dad finally arrived with his power-tools to put the wire supports in place. My Mum then trained the shoots into place. It rained. It wasn’t fun. They are troopers. Big up the parents and parents-in-law! We’re not 100% back in the land of the living, but there is light at the end of the tunnel. My gradual emergence from hibernation coincides with an indisputable lengthening of the days: the mornings are lighter, the evening darkness falls ever-so-slightly later. It’s not a lot, but it’s enough to make a difference. 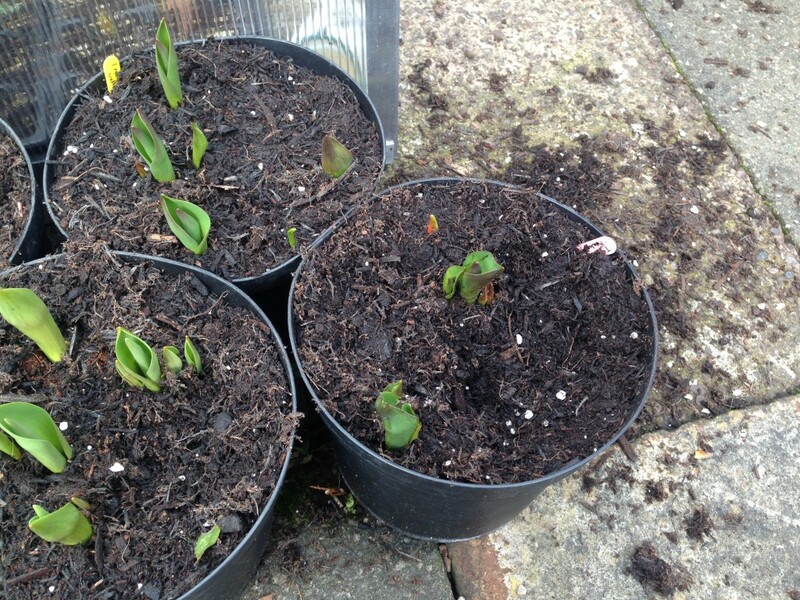 There’s been no gardening for weeks but, left to their own devices, the plants and bulbs are quietly waking up. 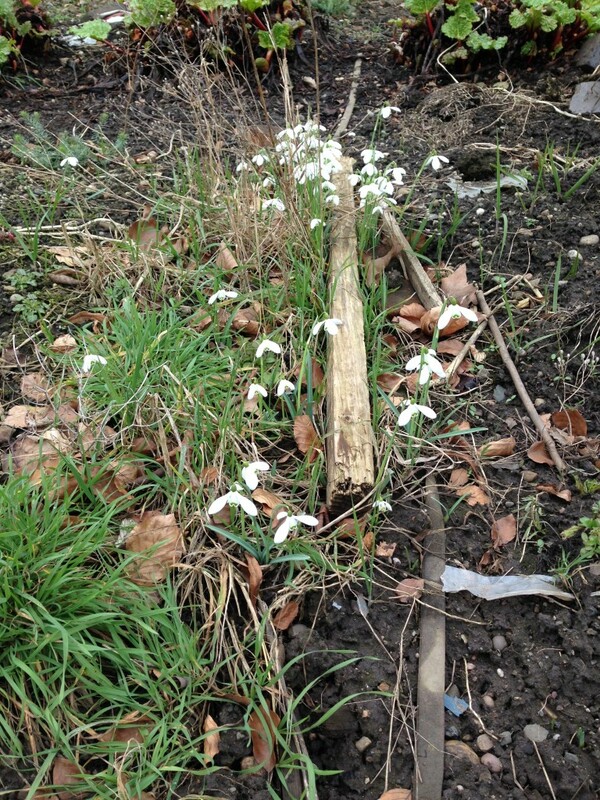 Tulips are pushing through (notwithstanding the inquisitive squirrels), there are a few tentative green leaves forming on shrubs and, on the allotment, a patch of snowdrops raises a smile. It’s easy to caught out by these first few hints of spring – there will doubtless be numerous more arctic days to come – but we must take our joy where we find it. I’ve moved a pot of narcissi to the front door so that, when they finally bursts into bloom, their yellow faces will make passers-by raise a smile. I feel just-a-little-bit broken by 2016, what with all the political turmoil. I’m not sure which is worse: the fear of terrorism, or the fear that extreme politicians are managing to persuade certain groups of people that it’s OK to hate other groups of people because they are different to themselves. Plus we bought a house (which used up my life savings), moved a workshop, worked continuously and didn’t get in a decent holiday. And lots of really good people died. This isn’t meant as a complaint, more of an observation that I’m running on empty: what’s needed is a proper break and time to regroup. The natural world can teach us a lot about pausing for breath: trees let go of their leaves, animals go into hibernation, all to conserve energy for the next year. 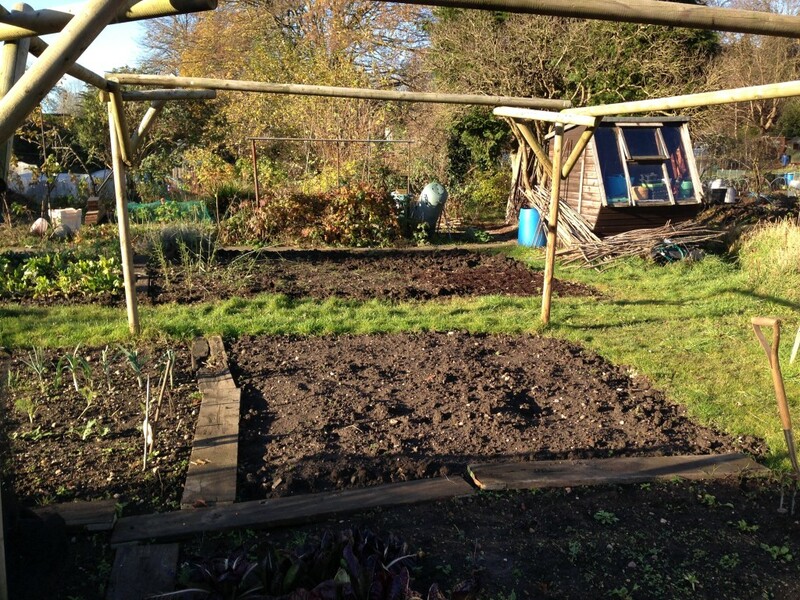 On the allotment the ground is bare now, save for the winter greens, and will stay that way until the spring. 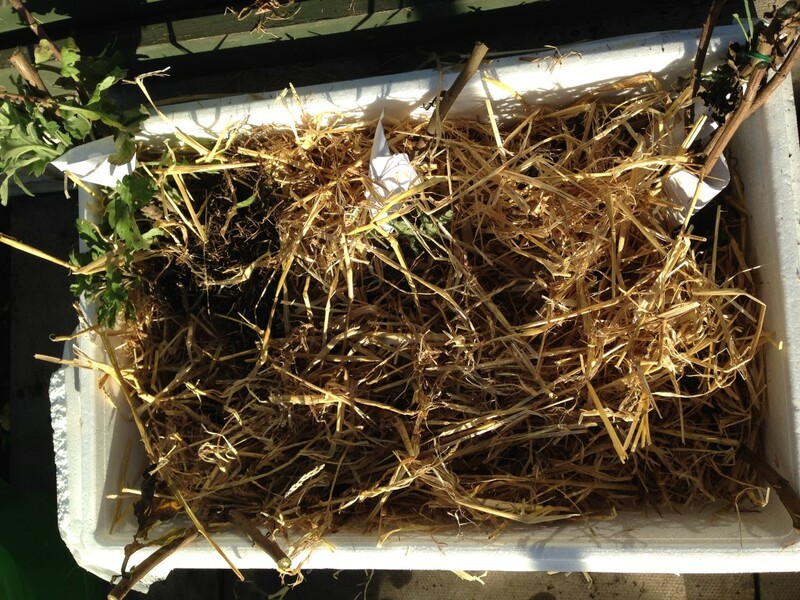 The chrysanthemums are wrapped up in straw and tucked away in the greenhouse to over-winter. 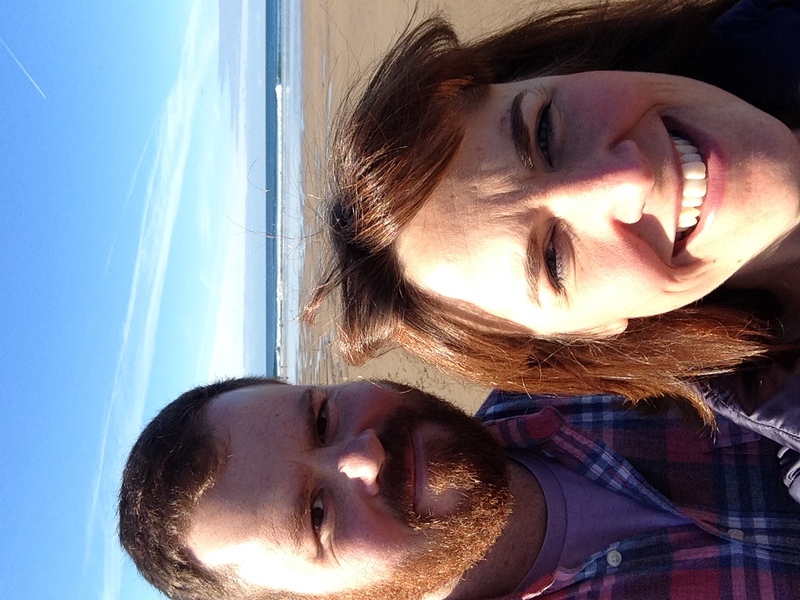 We headed down to Cornwall this weekend for two days of big skies and big beaches. 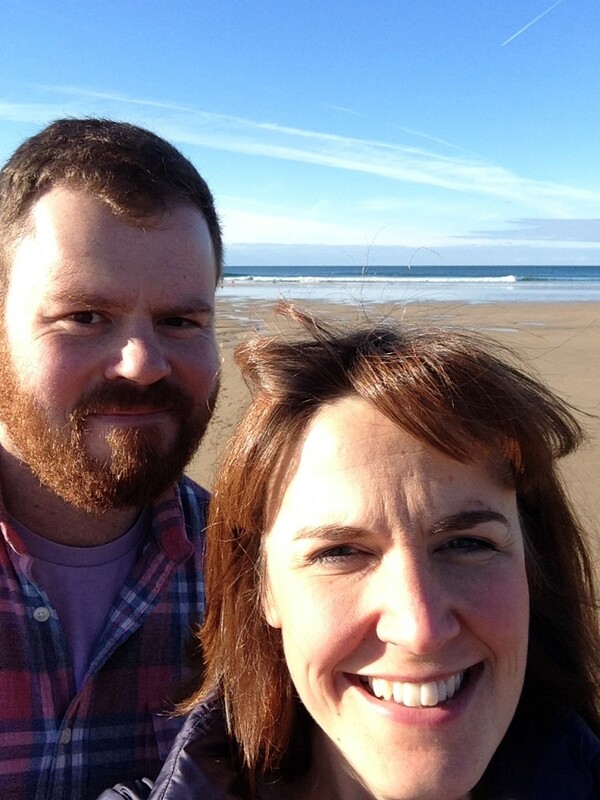 We were ostensibly there to catch the Padstow Christmas Festival (I spotted Rick Stein, Brian Turner and Fern Britton wandering around town) but really, we were there to eat pasties, walk on the beach and feel fresh air in the lungs. It wasn’t a two week holiday, but a change is as good as a rest. Plus we had a brilliant dinner at Zachry’s at Watergate Bay and I’m newly inspired to have a go at some new recipes: the prawns with gobi sauce, hake with romesco sauce, and panna cotta with burnt oranges were outstanding. I know it’s wrong to wish one’s life away, but my goodness, this winter now needs to be over. We’re still waiting on the mortgage confirmation, Matt faces a week or more of juggling work with moving his workshop, we’ve both been laid low with February colds: altogether life feels more than a little UGH. 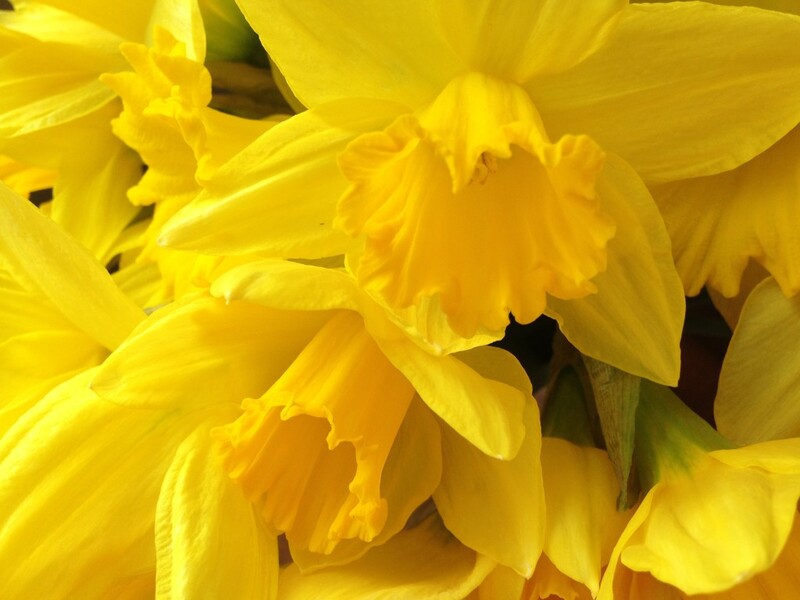 I’ve succumbed to buying bunches of spring flowers to brighten things up. 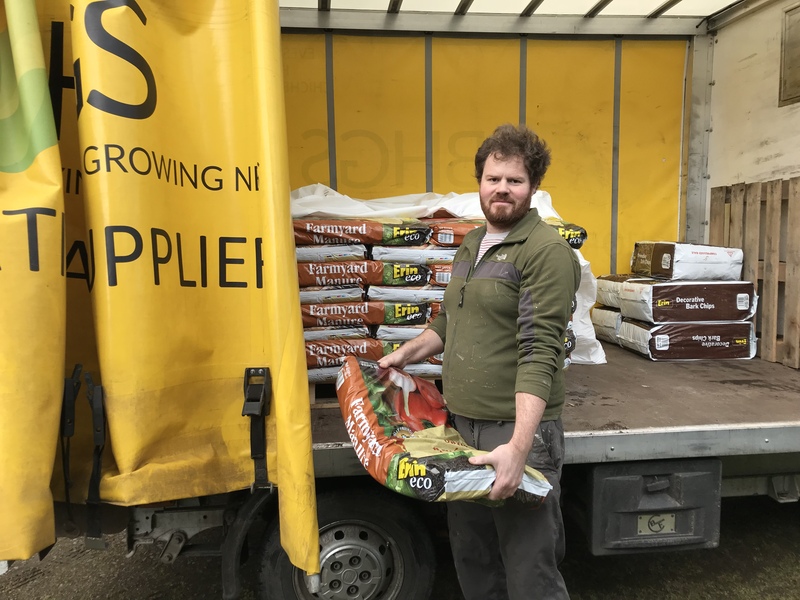 What with my mind being a fugg of viral infection, I’ve been struggling to summons up any excitement for the new growing season, but time marches along and it’s seed buying time. A huge envelope arrived on Saturday with my Sarah Raven order, a heady mix of scented flowers for cutting, all the usual veg and a few left-field choices (squash that grows up a trellis anyone?). In fact, there are now so many seeds that I’m uncertain where on earth I will find room to propagate them all. Alas the sweet peas that I sowed back in the autumn have taken a bit of sun damage. They’ve been hanging out in the greenhouse, survived the harder frosts easily but have faltered at lack of water (I’ve ignored them for the last two weeks). All being well they’ll recover but I’ve planted up a new tray just in case. I’ve also started off my tomatoes, five varieties this year in 36 plugs, though I only have room for 12 plants in the greenhouse. There’s two passata varieties here, plus a red plum cherry, a yellow round and black krim, a huge black traditional type. Part of the issue with waiting on this mortgage decision is that I feel in limbo, irrationally unwilling to spend any cash until our future looks more certain. And so whilst I’ve splashed out on seeds, I can’t bring myself to buy new pots and trays and am making do with battered old things that really should be in the recycling. Reuse, repair, recycle: it’s an attitude that suits the allotment. But perhaps I should succumb and at least get some proper labels….not sure that these post-it notes will last the distance. Our flat is surrounded by a kind of communal wilderness that masquerades as a garden: think lots of grass, a few very overgrown shrubs and the occasional empty crisp packet blown in by the wind. Last year I planted hundreds of spring bulbs in the rock-hard earth with the hope of brightening it up a little, and this week the green was broken by the first dainty yellow heads of tete-a-tete narcissi and deep purple crocus. I admire their bravery, for although the weather is generally mild and wet, there is still the chill breeze to contend with. The flowers bob around in the wind, withholding the onslaught. 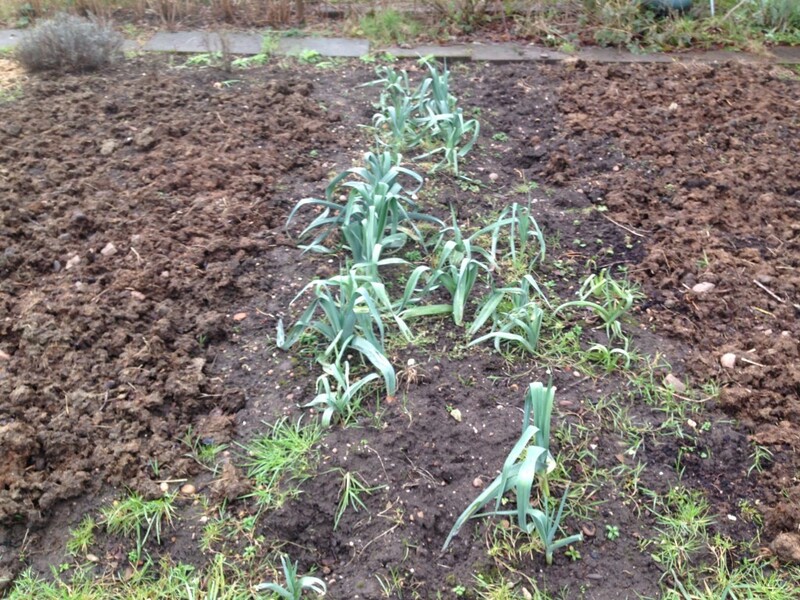 On the allotment, where the ground is more exposed, the bulbs are only barely beginning to break through the soil. Everything there seems to come to fruition about a month later than I expect it to. Is it the wind? Some lack of nutrient in the soil? 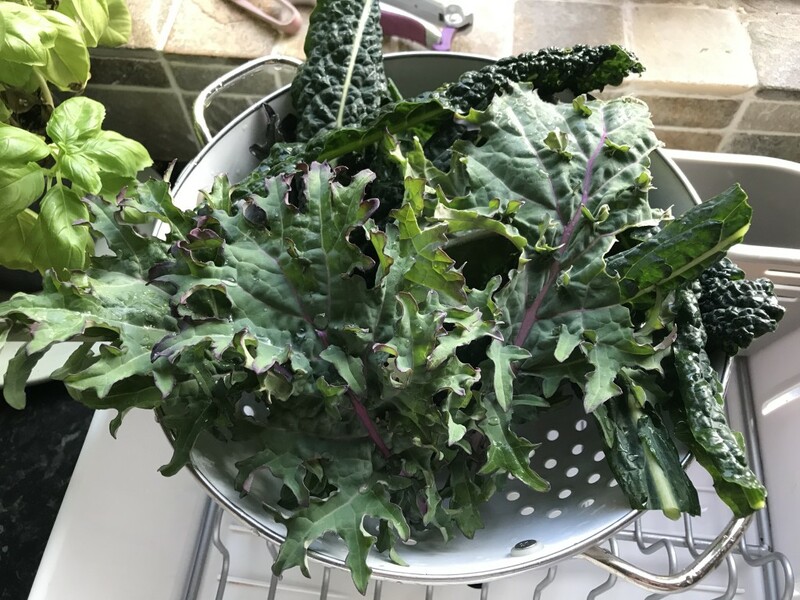 I did today manage our first harvest of purple sprouting, grown from plants gifted to us by Matt’s parents (though they’ve been picking theirs since before Christmas). I’m uncertain what happened to January; it vanished in a whizz of house-viewings and new work contracts. 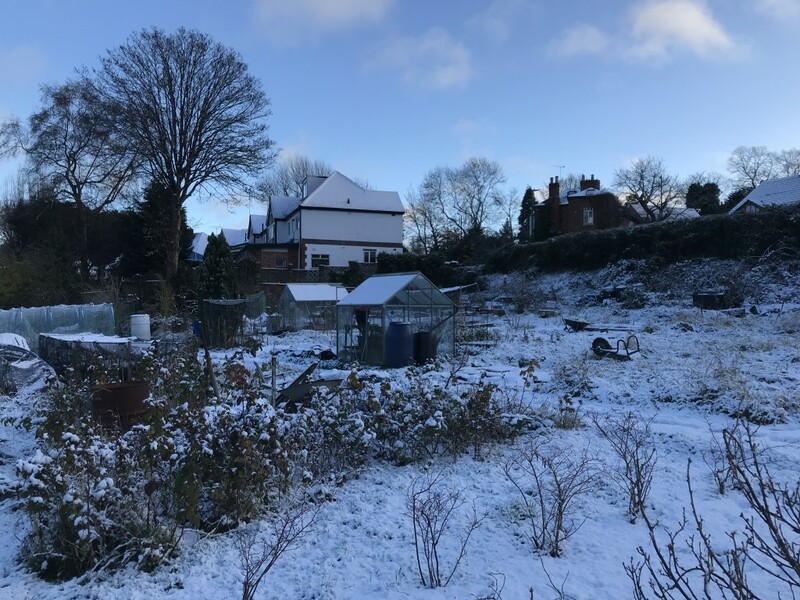 Suddenly it’s February, nearly the start of Lent – and we’ve yet to have anything that even vaguely resembles a proper winter. This is the month to trim back the autumn raspberries and so I got to it today, breaking my brand-new secateurs in the process. 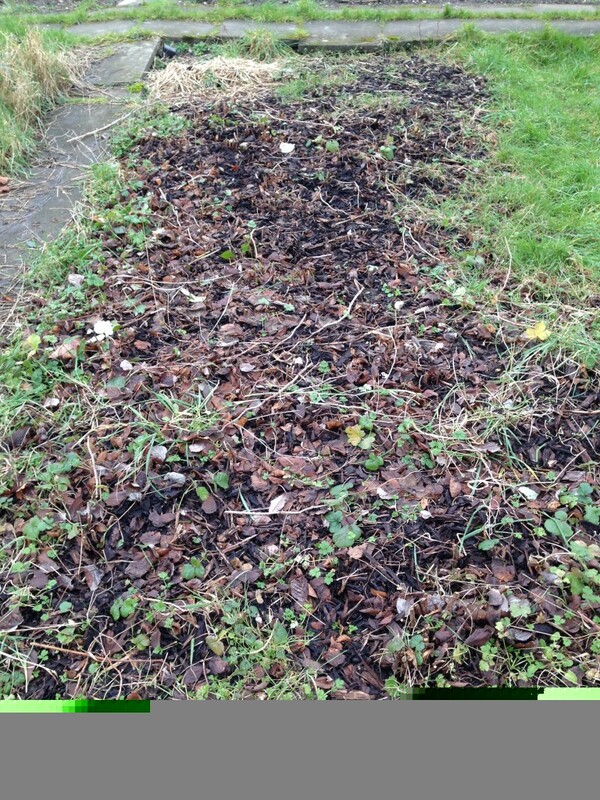 The patch is now clear of dead raspberry canes – but alas their removal revealed a healthy crop of buttercup and grass. As one job is completed, another presents itself: a good few hours of weeding and mulching is called for to clear out the weeds, one of my least favourite tasks. The raspberry patch, post-prune. At least we can grow buttercups. I feel like the weather, or at least the season, needs to catch up with the busy-ness of our current lives. At home and at work there is so much (too much) activity, new projects to be nailed down, this house-buying-bureaucratic-nonsense to be dealt with, things moving and changing. Yet outside the season is one of dormancy and sleep. In anticipation of season’s change I bring home my seed trays to wash (well, half of them: they get showered in the bathtub which is a two-batch process) and go through old seed packets to see what is needed for this year’s plantings. Allotment: Picked PSB, pruned raspberries, scrubbed pots, thinking about seed ordering. The past week has been swamped with unexpected stress: we are trying to buy a house! And whilst I knew that the house-buying process is not easy, I had not fully grasped just how many bureaucratic hoops have to be jumped through to get to the end goal. Time and energy is wasted spent attempting to get hard-copy bank statements (because internet print outs aren’t accepted), sorting ID details (only to find they are incorrect and have to be changed), getting our trading accounts in order and generally worrying about money. It’s horrible and therefore is very good yoga practice. I try to remind myself that bureaucracy is what it is and can not be changed…and that if the purchase doesn’t happen, we haven’t actually lost anything (apart from initial legal fees but I’ll gloss over that), so no point getting stressed. 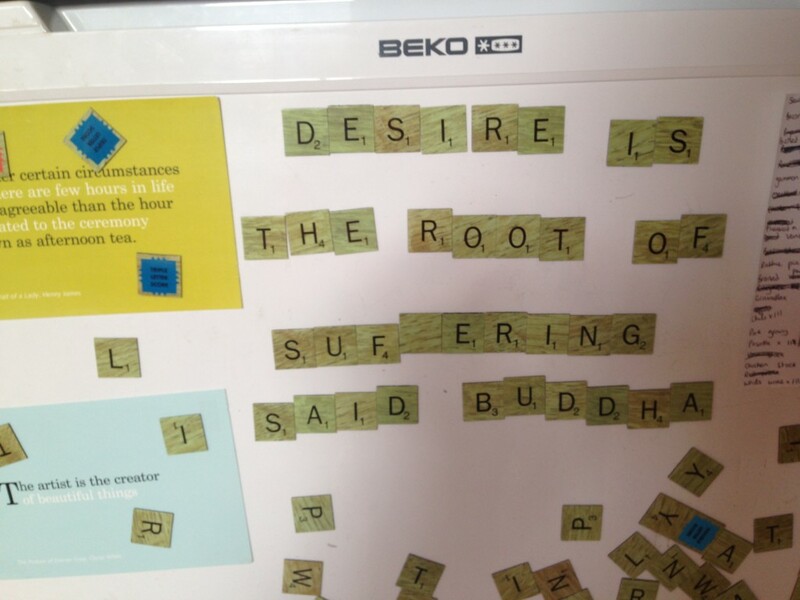 This is of course much easier said than done and so I have taken to writing motivational messages on the fridge. Amidst all this nonsense I am suddenly very busy with work and Matt’s preparing to move his business to a new workshop. It’s good at these times to focus on some very normal, everyday, grounding activities. What can be more grounding than a spud? Or – better – a bag of spuds? 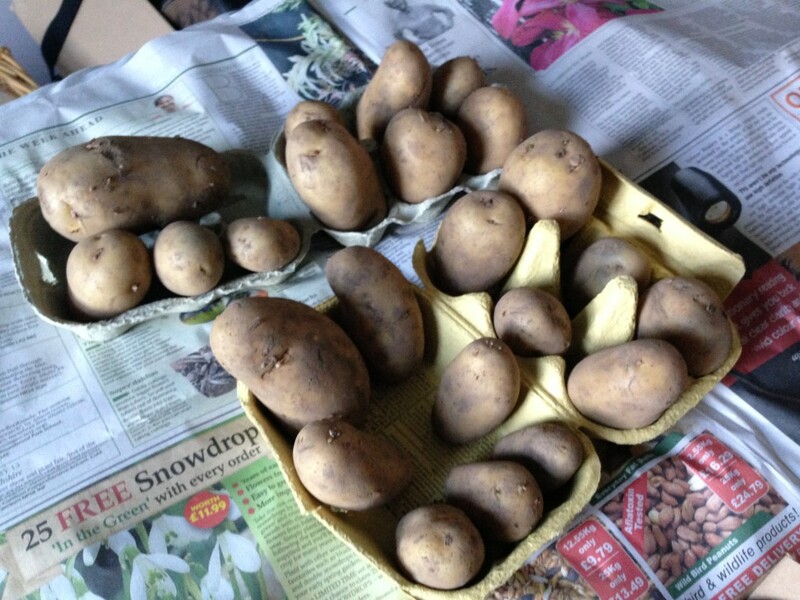 My Dad always manages to come up trumps when it comes for goodies for the allotment. This week he produced a net of seed potatoes, all ready for chitting. For the uninitiated, potatoes have to be chitted before they get planted out; all this means is that you leave them out in the daylight so the shoots can grow. 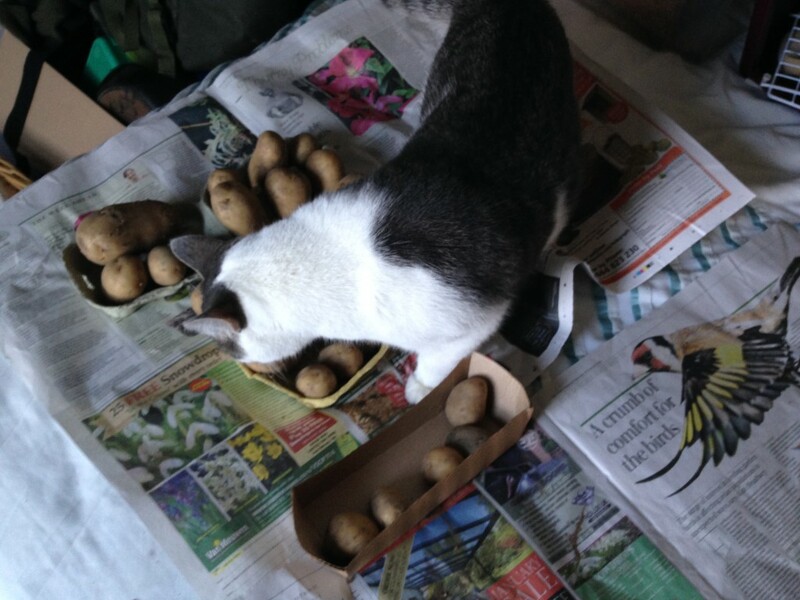 I’ve been saving egg boxes for just this purpose and emptied said spuds into them this morning. They are now laid out on the spare bed so they can start doing their business. These are Charlotte potatoes and should be ready for planting out in a few weeks, for a crop mid-summer. They lasted less than a minute in their new home before getting a nosey visitor. …but how long will they last? I found time to get to the allotment last weekend, curious to see what effect the frost has had on the last of the summer greens. Predictably enough, they haven’t fared so well: chard, spinach and chicory had turned into a slimy mess, coating my gloves with brown goo. But that’s OK: planted in April and lasting until January, they had a good innings. 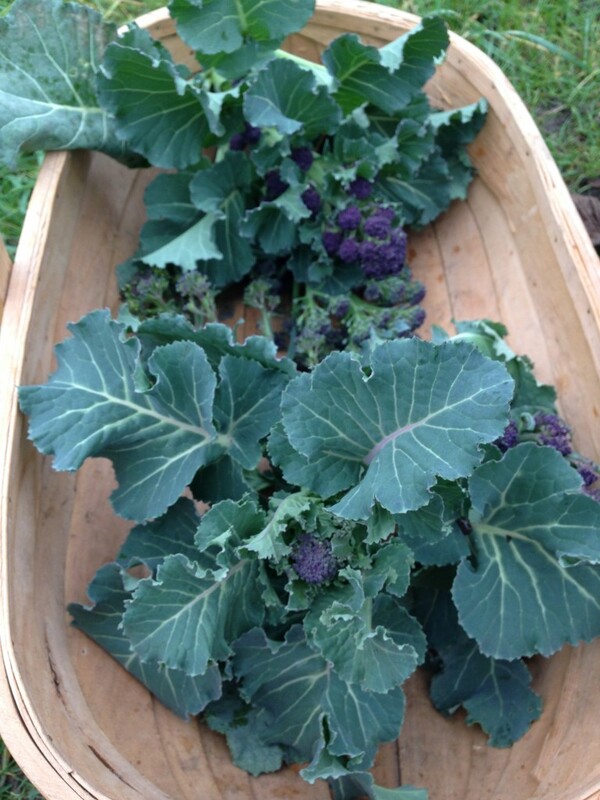 In the meantime, the winter brassicas have overcome all the odds (for we do not garden brassicas at all effectively) and there is purple sprouting broccoli (PSB) and sprout tops to harvest. No sprouts, mind, but I think sprout tops are more 2016 anyway. 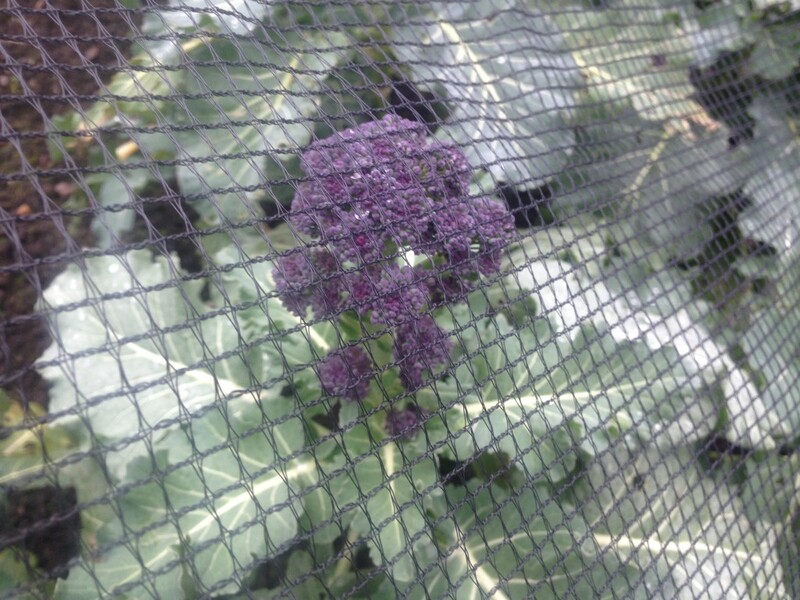 Before Christmas I foolishly removed the netting from my cavolo nero, thinking that the last of the caterpillar threat must surely have passed. What nonsense, for now they are shredded to the stem. What do you get if you feed the caterpillars? Fat caterpillars. I spotted one, lime green and bloated with kale. 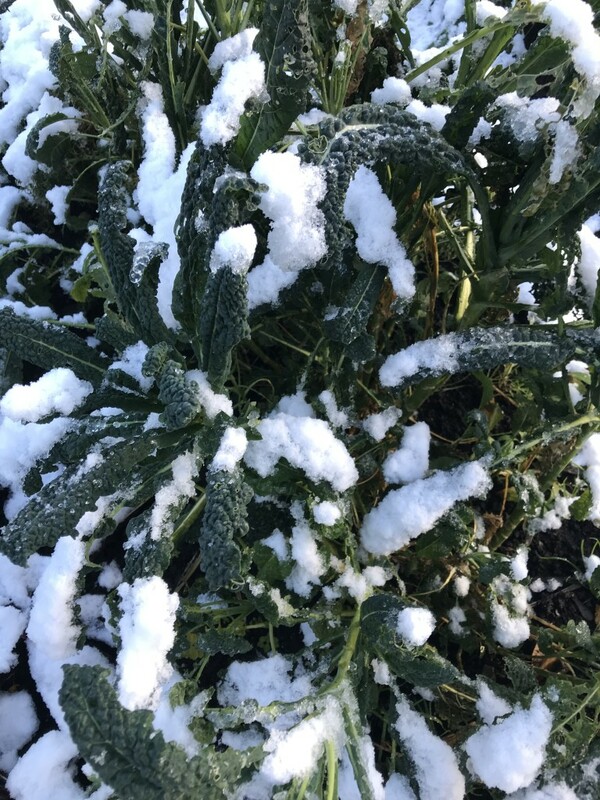 The leeks look perkier from the frost, the grubs that were eating them alive having been zapped in the sub-zero temperatures. 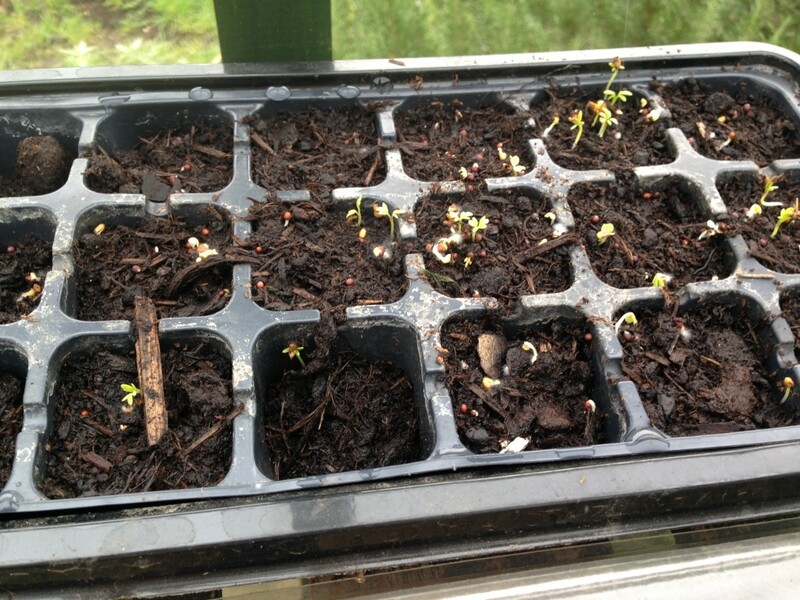 In the greenhouse, a tray of winter lettuce has germinated, the tiny green seedlings pushing north against the cold. It isn’t the best time to sow these seeds, light levels being so low, but they’re giving it a good go regardless. 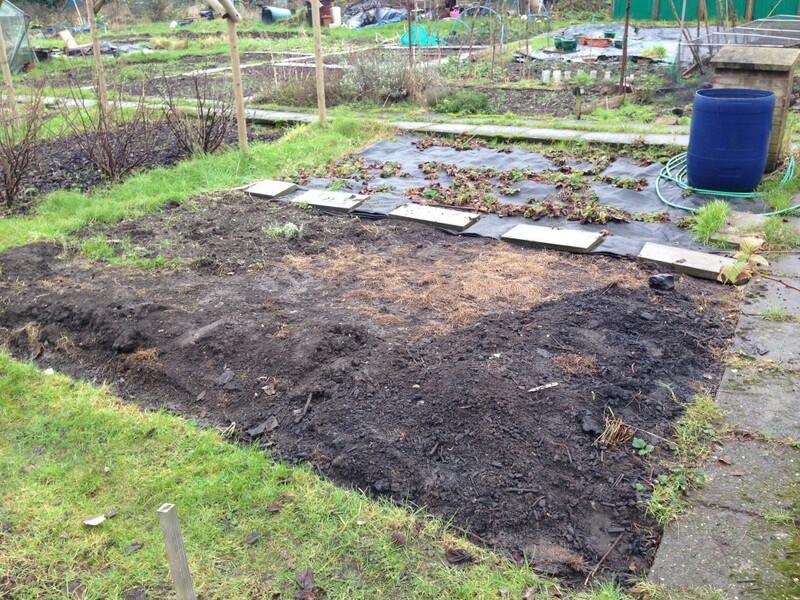 Finally, I removed the black matting that has been covering the last bit of overgrown, weedy plot. It’s been in place since last spring, so about 10 months, and look what beauty was uncovered! Weed free soil, perfect for a crop of potatoes. 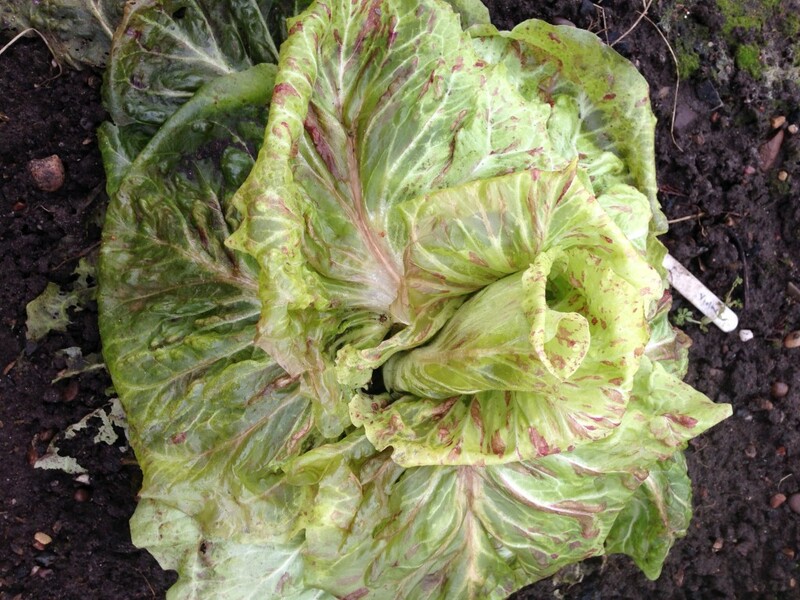 Allotment: Dug up last of the chard, spinach, chicory. Removed mustard spinach. Uncovered ‘potato patch’ land.